“There is a river flowing very fast. It is so great and swift that there are those who will be afraid. They will try to hold onto the shore. They will feel torn apart and suffer greatly. I used to think busy or chaotic periods were just that—unique and that soon things would settle down and get back to normal. Likewise, organizations would plan for implementing a change and then return to a steady state. Well… most of us have experienced change fatigue and now we need to accept that chaos and rapid change is the new normal. The military coined the term VUCA to characterize our times—volatility, uncertainty, complexity and ambiguity. While we recognize that change is constant, disruptive and fast, we need to shift our internal paradigm of change. How do we adapt? First, we need to give ourselves and others empathy. The shifts we are experiencing are not easy and difficult to manage. In fact, the concept of managing may be outdated. Instead, we need to be resilient and flexible and work with what is evolving. 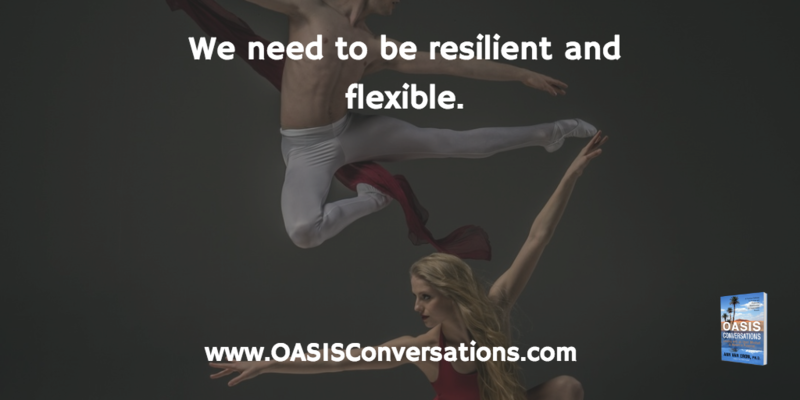 We need to work to be resilient and flexible. The Hopi Elder suggests that rather than holding onto the shore for safety and fighting the elements that we allow ourselves to experience the river as it turns and shifts. This does not mean we close our eyes and hope for the best. We can keep our heads above water by staying centered and present and making course corrections as we see obstacles. We can learn to ride the rapids. Ideally, we join with others and support each other on this challenging journey. When we relax into the evolving river of change we will see more opportunities. Experiment with shifting your view of change from waiting for stability to learning to flow and experiencing the opportunities. Who will you connect with on this journey for support? This entry was posted in Change, Resilience by Ann Van Eron. Bookmark the permalink.